GDC2 is the model name of a condenser microphone capsule developed by JZ Microphones of Latvia. 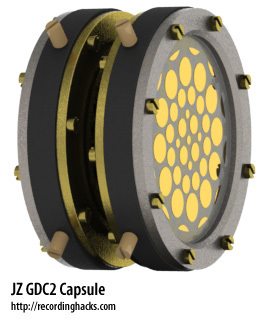 The GDC2 is an assembly of two single-diaphragm capsules mounted back-to-back, with an air gap between the capsule housings. The two capsules are mechanically independent. Each of the individual sides is a single-diaphragm capsule whose Mylar membrane measures 27mm in diameter. The diaphragms is metallized using JZ’s “Golden Drop” technology, in which discrete drops of gold alloy are painted onto the Mylar film.